Picked up a 2014 Kona Unit on Friday. This is my first SS bike and also my first rigid mountain bike. Tossed on a pair of SPD pedals and some SLX brakes that I had in the garage and got to take it for a spin today. First impressions are that it's a totally different ride from the full squish bike that I'm used to. The pureness of the single gear bike was sweet. Bike came stock with 32-18. For the trails I ride, I will probably give 32-20 a shot. Lot's of climbs here in So Cal. Probably going to have to go with a squish fork as well. The Kona P2 fork was harsh in the rocky environment that I ride in. Jarring on the down hills unless I was creeping. It was a fun change from my other bike. Definitely more challenging climbing. Momentum is definitely your friend. Look forward to getting some more SS miles in. What tire pressure are you running in the ardents? Very low pressure helps tremendously on the rigid. If that doesn't work, get a suspension fork. I ran 25 with tubes. I have tape and valves showing up this week and will convert to tubeless so I can run them lower and play around with the pressures. Welcome to the Asylum! Your Riding Bro's will become quite jealous of the attention you'll be receiving from their women to your newly sculpted calves and quads! Why, you'll be like Adonis himself! Ditto on Slips comment. my full sus got so dusty I sold it and go only rigid SS. now in the market for another ss with a fork for certain events - double SS equals a two speed right? Congrats! I've had my 2014 Unit since Dec, and it's all I ride now. I too ride here in SoCal, and I hear ya about the unavoidable rocky terrain. I have gotten pretty beat up a few times(and almost bit it) when I didn't "creep" down those rocky descents as you say (but I'm the slowest guy on the trail anyway so it doesn't change much in my case . I switched to 32x20 right away. My next move will be a bigger tire up front, but that's actually more because I want to try and improve my traction on all the dry loose stuff over hardpack here. Last edited by jbass; 05-11-2015 at 07:53 PM. I'm in Northern Colorado and my Unit is a 2012. When I bought mine I figured I'd get a suspension fork. 2.5 years later my FS has been sold and I'm riding rigid with a 2.4 up front. My average rides are about two to two and half hours. If I'm out around 4 hours I begin to feel it. Once I began to get used to the new style of riding I started to feel that a suspension fork was the last thing I wanted. I think it's good to give yourself time on the bike before making that decision. Either way I think you're going to love it. I'm riding more than ever before because I love it so much. I love the lines of that bike. My OCD is killing me on that rear wheel sticker placement. Those BASTARDS!! I remember my first ride on a SS bike. I just knew it was for me. I loved the quiet simplicity of it. I went out and purchased a Kona Unit and it's now the only bike I own. It sure makes me choose my routes a little more seriously though.lol. Other than that it's a pretty easy going ride. I love it. Give rigid some time before you revert back to a suspension fork. Biggest thing is staying loose on the bike. 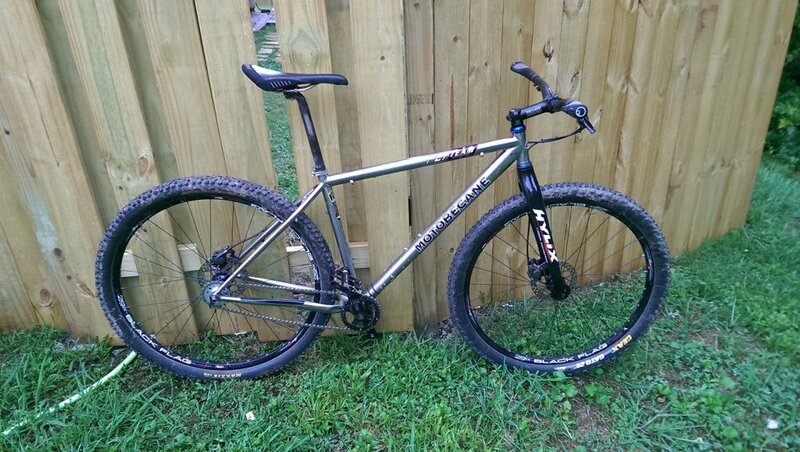 ….2.5 years later my FS has been sold and I'm riding rigid with a 2.4 up front…. My 2014 Unit is in for it's last free tune-up at the LBS I bought it from, so I figured while they're at it, I'll have them put a 2.4 up front. Excited to try it out this weekend. I've been running a Pike on my SS for the last year and Float before that and finally went back to rigid. First ride on rocks was a ***** but the second was a lot better. Sticker is nicely opposite the valve. Tyre is mounted WRONG! Wrong! I tell you! I just mounted a 35mm Velocity Blunt with a 3" tire on the front of my rigid SS and it dramatically changed riding rigid. Not to the extent of riding suspension, but certainly smoothed things out quite a bit. Just get the bike nice and muddy and no one will be able to see it.. Going from 2011 19mm rims on my Unit to 2015 i23's was a big difference. Unlike a sus bike, the equipment isn't going to do much for you. There's a lot of technique involved and you can't spend your way out of that. Well, you can by buying a sus fork but spending a similar amount of money on a carbon fork isn't going to have the same effect. That said, I think the best purchase I made was Jones bars. Primarily taught me how to move around in the cockpit, weight and unweight the front end, so mostly a tool to learn technique. I do think it puts my arms in a better position to absorb bumps. Get extra chunky foam grips and pay any price to have them put on for you. I imagine the Jones titanium would be the absolute bomb but sheesh I'd have to take out a loan. Just thought I'd post back and share my thoughts since I've had a half dozen or so rides on the SS. First off, I picked up a 100mm Fox RL for the front. Huge difference. This bike is now a lot of fun! The squish + the steel compliant frame actually soaks up the trail chatter really well. I've also added an Enve carbon bar and a Thomson post. The bike really is a blast. Definitely a different experience climbing, but I like it. I'm climbing most of the same stuff I did on the geared bike, just with different technique. I purposely only rode the SS for 3 or 4 rides than went back to the geared bike this weekend. I thought it would make climbing feel way easier, but it didn't. However, I did find myself climbing a couple of gears higher and climbing faster. I never hit my granny. I doubt that my legs are that much stronger after only a few rides, so I chalk it up to learning better climbing techniques because I had to on the SS. All in all, I'm having a blast. I wasn't sure if I'd stick with the SS experiment, but I'm sold now. At some point I'll toss a better wheelset on the bike and really see it fly. 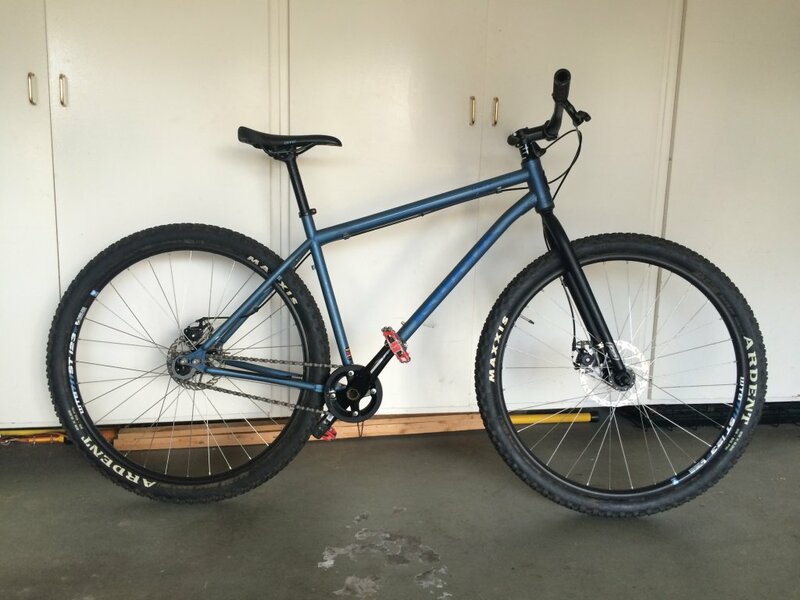 At 28 pounds with pedals, it's still a little porky for a ss hardtail. Edit: One last thought, I did go 20 on the rear cog. Feels better climbing, but I still spin out sooner than I'd like on the flats and slight descents. Hopefully as I get stronger I can swap back to the 18 in the rear. Actually what you learned was that your body can handle a lot more than most of us will give it. You would normally shift down into your granny gear because that is the way we all learned how to do it....whether we actually needed to or not. Get to the bottom of the hill, shift into easiest gear. Also, 18t cog sounds like it would be rough around here in SoCal. the 20t will spin out quicker on the downs and flat, but you will adjust and just learn to pump the trail features. One last thought, I did go 20 on the rear cog. Feels better climbing, but I still spin out sooner than I'd like on the flats and slight descents. Hopefully as I get stronger I can swap back to the 18 in the rear. 10/3/12 Springs area To ride or not to ride.....Ride.